Corporate & Incentive Travel – experience Ireland like never before! Are you looking for quality, well organised, innovative and unique tours for your next Customer Visit? 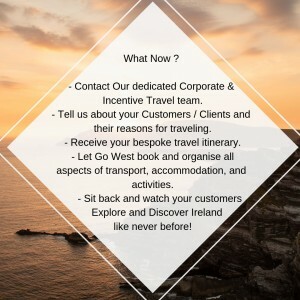 Go West has 24 years experience as a one-stop shop for all Corporate & Incentive travel in Ireland. We are experts in providing solutions to your Accommodation, Transportation, Activities & Entertainment needs. Go West will cater for all our customer’s needs and interests. Each tour is customised for your group, Your Itinerary will be packed with the best activities, the best restaurants, and the best transport & accommodation options. Go West will ensure your customers/clients get the best treatment all along the way. We have over 24 years experience providing excellent value and peace of mind knowing that your customers/colleagues will have the best experience in Ireland.